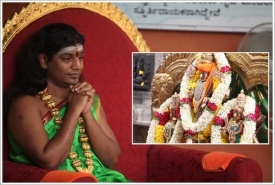 On this auspicious date of 11/11/11, Swamiji reveals his insights into the coming planetary shift of 2012 and touches on the Mayan Calendar, commenting that even after so many interpretations, the meaning of the prophecies is uncertain. 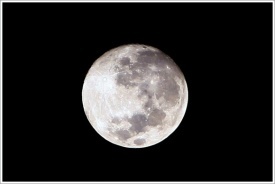 During the full moon night, the planetary energies are such that the rejuvenation in our lives can happen very easily. Tiruvannamalai aka Arunachala hill is one of the intense energy field in the planet Earth and is the birthplace of our Swamiji . Swamiji says “ Arunachala is the spiritual light house which attracts Enlightened beings”. What a Beautiful Sight it Was!! 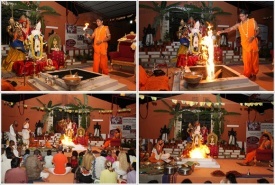 After the Bhagavad Gita Satsang all the devotees and disciples gathered in the Sri Nithyanandeshwara Temple to participate in Abhishekam (holy bath)to Lord Subrahmanya. What a beautiful event this was and such a blessing to be part of! 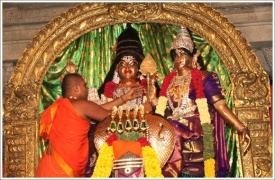 The Abishekam was followed by Kalyanotsavam to Lord Subrahmanya.